If you are a beginner in pool or billiard game and you are in search of some cheap pool cues within cheap price range then you can go through this article. 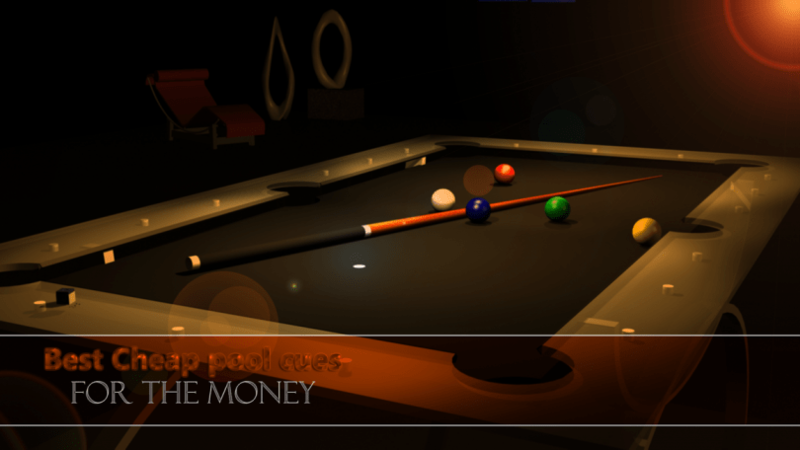 This article will help you to select best cheap pool cues. As a beginner, you don’t have to always buy a professional pool cue with lots of money. First of all, you need to learn all the techniques and skills of the pool by playing with a beginner level pool cue. If you buy a professional level pool cue by spending lots of money then, in my opinion, it will be a terrible waste of money, because, in the beginning, you might break the cue by hitting the balls improperly. So now you decide as a beginner you should buy a professional pool cue or a cheap quality pool cue. Let’s not waste the time and get to the rundown of best cheap pool cues. 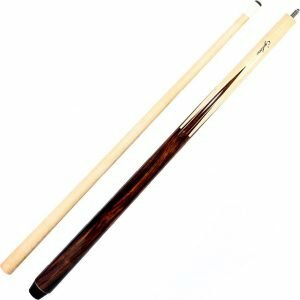 The Cuetec Professional Series 1-Piece Canadian Maple Billiard pool cue is the winner in our rundown of best cheap pool cues. This cue can be used in the tournament as well as at home to play pool. It got the 1st position because of its professional level performance. You won’t get any trouble to put the cue together and also don’t have to look for a carrying bag as it is a single piece pool cue. You will get a long lasting performance from this cue as it is made with premium quality North American maple. The design of Cuetec Professional Series 1-Piece Canadian Maple pool cue looks simple and plain. Those who don’t like crazily designed pool cue this cue will be great for them. 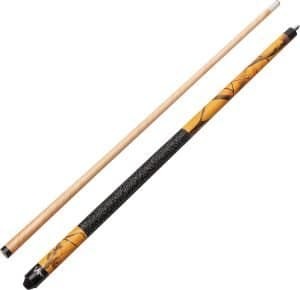 In addition, this cue is scratch resistant and smooth to touch as there is a composite coating on the maple of this cue. The cue is also safe from bending or warping, because of its coating over the cue. Those who love to play with shorter cues this cue will be best for them. If you need this cue to be long in size then you can select it while buying. There are different sizes and weights of this cue available, which means you can choose as per your wish. This cue will be perfect for you if you are looking for a lightweight cue with different cue length. 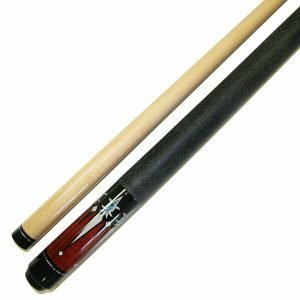 Within an affordable price, this cue is offering lots of features with great durability that makes the cue to be the number 1 on our list of best cheap pool cues. While you are going outside to play pool then you will be having troubles to carry your pool cue if it is not 2-piece. You can get rid of this trouble by purchasing Viper Signature 57” 2-Piece Real tree Camouflage Pool Cue as this cue comes with 2-piece. If you are thinking that Realtree Camouflage is just the title of this pool cue then you are definitely wrong, because it is a pattern that is included on the shaft of this cue. Actually, Realtree Camouflage is a unique feature that makes this cue 2nd in the review of our best cheap pool cues. 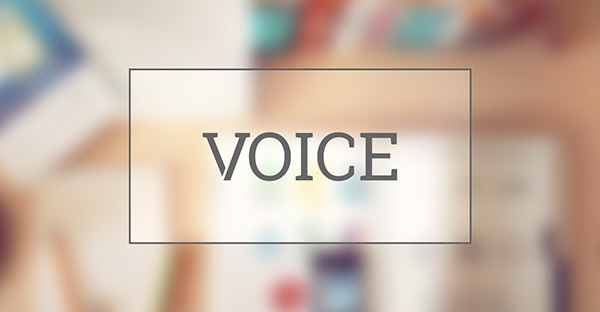 There are so many other features that help the cue to perform amazingly. You will love this cue if you use this cue once in your pool game. You can carry this cue without any trouble, you won’t even need a carrying case or bag to carry it as it’s a two piece cue. The two pieces of this cue can be screwed together so that it can be carried easily. Now let’s come to the quality of this cue, the cue is made with Canadian maple hardwood, which means it will be great in quality. Viper never compromise their quality, they always make pool cues with premium quality. The ABS joints that are used in this cue will help you to feel comfortable while playing your game. You can also control your shot by using this ABS joint technology. Overall this pool cue is amazing and has all the qualities to become best cheap pool cue. The Cuesoul SOOCOO Series 58” 2-Piece Maple Billiard Pool Cue will be perfect for those who want to use it in both home and tournaments. This cue will help them to play their game professional at tournaments and they can also practice their game at home with this fantastic pool cue. As the cue comes with 2 pieces, the cue will be easier to carry anywhere. The collar of this cue is made of stainless steel that will allow you to hit the cue ball with as much as force you can. You don’t have to think about breaking of this cue. High-quality Canadian maple wood is used in this cue to ensure good durability. 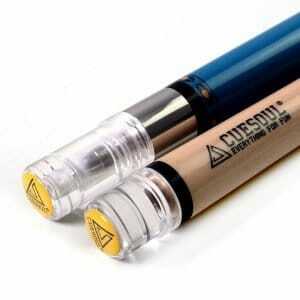 The cue is also designed amazingly by Cuesoul, which can attract anyone’s eyes. The bottom of the cue is bright blue and the top has a pearl finish, which makes the design of the cue superb. To deliver a perfect shot on the board the rings are made of stainless steel. You can keep your cue always neat and clean by the cloth that comes with the cue. This cue will be perfect for long shots as the cue length is 58”. If you are looking for a professional pool cue with attracting design then you can go for this pool cue. As you know best cheap pool cues are hard to find, this one is best cheap pool cue so don’t miss it. If you love pool then you must need to check this best cheap pool cue named the Imperial Officially Licensed NFL 57-Inch 2-Piece Billiard/Pool cue. You will love this pool cue if you know how simple this pool cue to carry anywhere. The cue comes with a soft case which will help you to take the pool cue anywhere you want. What makes this cue different from others is its logo in the wrap which is set in the centre. 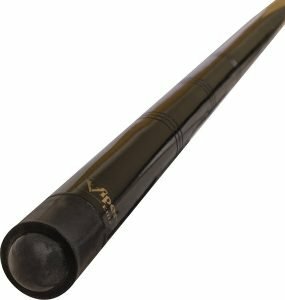 This pool cue is capable of delivering a great type of performance at home and even at a professional game also. The cue is just as incredible as its design as the cue can be separated into two pieces and also comes with a nice soft case to carry. You can control your every shot with the help of the leather tip that is used in this cue. The Shaft of this cue is also made with maple which ensures the excellent quality of the cue. The Charming design of the cue can be eye-catching for many pool lovers. Within an affordable price, the cue is just awesome to play your game. If you are looking for a cue with good performance for you home practice then you can surely buy this one. The Iszy billiards Hardwood Canadian Maple Pool Cue is good for those pool freaks who want to have a good cue in their home pool table. If you get this cue to play at your home pool table then I can assure you that you don’t need to change this cue for years. Once you play with this cue then I don’t need to tell you anything you will love this cue. The amazing fact about this cue is that it will come with a set of four. All the cues are of the same length but they come with different weights. There are weights available from 18-21oz, so you can choose as per your shot to play your game professionally. You can also choose the design of the cue, if you want four cues to be same design then you can choose while purchasing. On the top of these cues, Iszy used 13mm leather tip that will ensure that you can hit each ball perfectly. At the bottom part of these cues has a linen wrap that will deliver you a good smooth performance. Brown colour Canadian Maple wood is used to deliver a great durability. Stainless steel joints are used in this cue that reduces the vibration of the cue while taking a power shot. The ferrule of the cue is made with fibre. To give you a proper smooth touch to the cue Irish Linen wrap is used. If you purchase this cue you will get a set of 4 cues with different weights, which will allow you to play your game professionally. Though the name of this cue is not familiar with its amazing features and performance the cue made its place in the review of our best cheap pool cues. While you are playing pool outside your home then you need to look confident and comfortable to win the game. So you will get all of this with this Minnesota Gats Hustler High Tech Grip Graphite Cue. The cue is designed so amazingly that if you have this cue on your hand on a pool table, everyone’s eyes will be looking at your cue. You can choose your favorite color as this company lets you choose. There are two colors are available for this cue, one is metallic blue and another one is traditional black. This cue is made with some solid high-quality premium materials. The cue is made with graphite and its core made with a polymer resin. There is maple is used also to give the cue an amazing look. You can play with this cue regularly and powerfully without being tensed of getting a warp. With the high-tech grip of this cue, you can play your game more professionally than ever. The cue is perfectly straight that ensures you a quality game. Stainless-steel joints of the cue let you play your game with a good control. Overall the cue is amazingly designed and made with some quality materials that can deliver you great performance. So, you can go for it without any doubt. This EastPoint Sports 2-Piece Fiber-Tek Billiard Cue will let you keep as much distance as you want. While playing your game, you may need to go close to the pool table or sometimes you may need to go far from the pool table to take your perfect shot. You can take your shot from any distance you want with this cue as the length of this cue is 58”. Now if you are thinking that the weight of this large cue might be heavier than other cues. Let me tell you that you are totally wrong because this cue only weights 19 oz which means it’s a light-weight pool cue. This cue is better than all other best pool cues with its cool design and performance. Beginners, as well as professionals, can use this cue to play their game with great performance. This is one of the best pool cues in the market right now. Most amazing feature of this 58” pool cue is its composite coating over the cue, which makes this cue warp and scratch resistant. The tip of this pool cue is made of aluminum to deliver superb performance. There are screws around the tip which can be on and off so that you can use several types of tips. 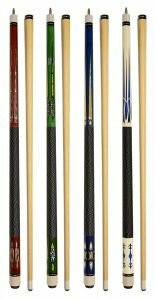 For having all these good quality the pool cue is in our review of best cheap pool cues. If you are looking for a cue to use both at home and tournament then you can surely get this budget-friendly cue. With a good build quality and affordability, the Imperial Premier Cyclone 2-Piece Hard Rock Maple Billiard/Pool house Cue got 8th position in the list of best cheap pool cues. The cue is also known as Sneaky Pete because of its affordable price. You can use this cue comfortably at your home pool table. There are varieties in sizes of this cue, three sizes are available on comes with 42”, one comes with 48” and last one comes with 52”. You can choose your size at the time of purchase. Carrying of this cue is easier than other 1-Piece pool cues as the cue comes with 2-piece which also save your storage space of your house. 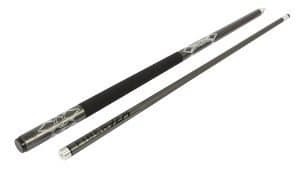 Within a cheap range, this cue is providing lots of good features as well as good performance. The cue is good straight and smooth to touch which are the important factors of best pool cues. A cyclone logo is set in the center of this cue. The cue is made with combined dark and light maple to give it a charming look. For all these cool features the cue is in the list of our best cheap pool cues. Overall the cue is good enough for using at home pool table. Unfortunately, the cue is not for professional use. This is one of the best cheap pool cues on market with fair performance. The Viper Commercial 1-Piece Hardwood Billiard/Pool House Cue is good for kids as well as adults. If you are tensed that your kids will break this cue then forget that because the build quality of this cue is so great that your kids won’t be able to break it. It comes in two different sizes, 48-inch and another one is 36-inch. For kids, 36-inch will be perfect and the 48-inch one will be good for both adults and kids. As the length of this cue is quite short the weight of this cue is also light enough to play your game comfortably. The cue is designed in the way to deliver you the best performance even if there are so many people around your pool table. To protect the cue from scratch and warping the manufacturer of this cue made this cue with nine different layers of varnish. 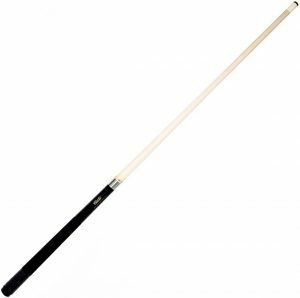 The standard 13mm leather tip is used in this cue to hit the cue ball with more power. It also has woody finish beside the bumper and the bumper of this cue is made with ABS technology. This one is surely the best cheap pool cue on the market. For beginners, this cue is the best cheap cue out there. The Billiard Depot Set of 4 House Pool Cue Stick pool cues are for those who want to have several pool cues within a cheap price range. This is a set of 4 good quality pool cues and the size of this pool cues are same 58-inch long. The best part of these cues is that all the four cues come with 2-piece, which means you don’t have to worry about the storage space. These cues will save storage space of your house and these cues will not be any trouble to carry outside as it comes with 2-piece. At a very cheap rate, all these cues are best cheap pool cues. The tip of these cues is 13mm in size and made with leather that ensures that you can hit the cue ball as fast as you want. But the sad part about these cues is that you can’t use these cues to play a pool tournament. You can’t expect more within this price range. The design of these pool cues is also different from each other. If you are looking for some cues to play and practice at your house pool table then I can assure you that these are the cues that will fit in your budget. These are the best cheap pool cues on the market right now.